Why is the Penny English stamp like a newspaper? Because it was first black printed on white, and then red (read). No one posted an answer here on the blog, but several people answered when I posted it on Facebook. Marty Mazur’s answer was the closest to that printed in the magazine. Congratulations, Marty! Why is the Tuscan lion like the British Empire? 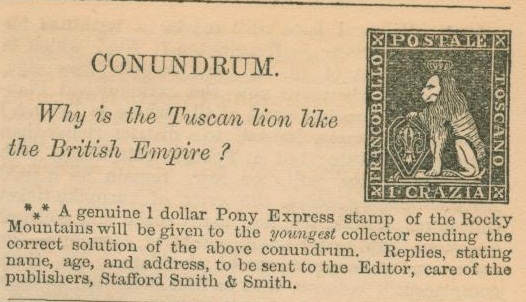 Sorry, but we can't offer the prize that the Stamp Collector's Magazine editor did! It’s gotta have something to do with the symbol of the British Empire having it’s foot on the symbol of France (fleur-de-lis).